I have a special fondness for cream cheese, particularly as an ingredient in baked goods. It's the killer ingredient in my chocolate chip pound cake, for instance. I watch for sales on cream cheese and buy a half dozen bricks at a time. First, let 4 ounces (half an 8-oz. brick) come to room temperature. Then cut into chunks and place in the bowl of your food processor. Warning: you WILL be tempted to lick the blades of the food processor. Do not yield: the blades are very sharp! Then you can add a ladylike drizzle to whatever baked good you like--or you can be like me and pour on a heaping spoonful! Y'all. This is so good. SO good. I wish I could let you lick the spoon! Need a good recipe for pumpkin bread? Click here for mine. Cut cream cheese into hunks and place in bowl of food processor. Add powdered sugar, vanilla, and 1 Tbsp. half-and-half. Process for several seconds. Scrape down sides of food processor bowl. Add additional Tbsp. half-and-half and process until smooth. Pour or spoon over carrot cake, banana cake, pumpkin bread, cinnamon rolls, etc. **I'm joining Amanda at Serenity Now for Weekend Bloggy Reading. Head over there to see other fun posts! I can only imagine how wonderful that must be. Cream cheese is so delicious. You know, for years I bought the 1/3 low fat kind. Then we ended up with regular cream cheese once and realized how much better it is! I'm a new kid in this blog. Lot's of fun places, ideas and absolutely loving the cream cheese goodie. Off to my kitchen (which will need many new items this spring created off this fabulous blog). Husband has been busy doing catch up list in our house this weekend. 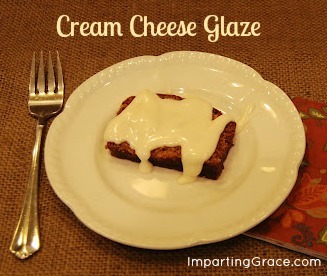 Treat him with cream cheese glaze on dessert tonite. Thank you for your imagination, dear new friend! Oh my! I will have to try it for sure :o) Thanks for sharing the recipe! oh yum! Can't wait to try this one. Cream cheese is a delicious ingredient. Your icing recipe sounds like the perfect addition to a yummy slice of cake. Sifting onto a piece of waxed paper is a great tip. I need to remember this! Yum! Can't wait to try it out over pumpkin bread!! That looks soooo yummy! I love cream cheese frosting/glaze, etc. I wish I could lick the spoon too. Totally agree: cream cheese frosting is THE ONLY frosting in my book :-) Love your antique sifter too! Yes, my favorite thing about carrot cake is the cream cheese frosting! Your recipe sounds delish! Hey Richella! I found this on Amanda's blog. Yum! I usually do milk & powdered sugar glazes but I'd love to try this one out sometime. Thanks for sharing, looks yummy! :-) Have a great weekend!